« Calling All Student Falcon Artists! Today, with the help of the New York State Dept. of Environmental Conservation, we fitted Quest with a solar-powered satellite transmitter. Her stylish new high-tech gear will help us to track her movements after she leaves the nest box. 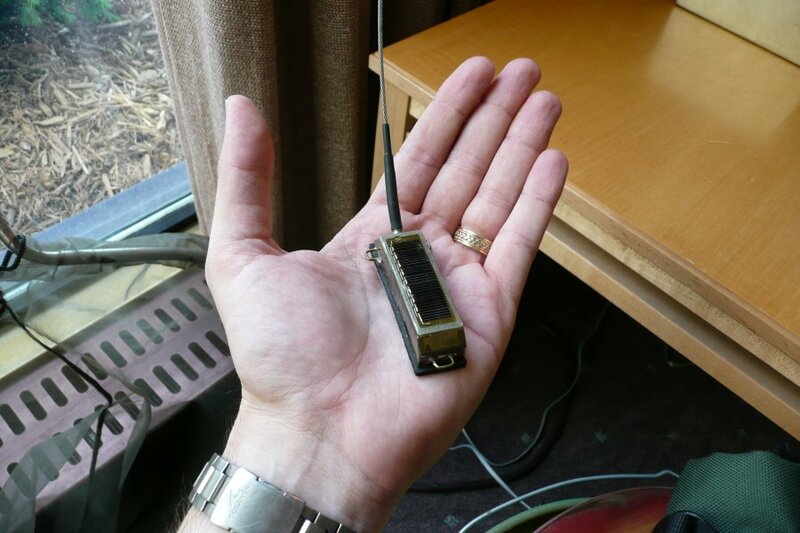 Quest was chosen to carry the transmitter during last week’s Banding Day. Mike Allen and Barbara Loucks of the DEC found her to be the biggest of the eyases, which will give her an advantage when carrying the 22-gram transmitter. 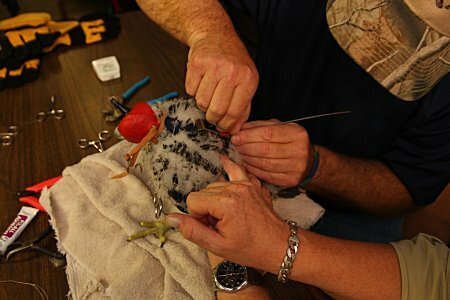 Mark Nash of the Canadian Peregrine Foundation came from Toronto to lend his expertise, while Mike Allen got to play tailor, sewing the neoprene harness that holds the transmitter. Rochester Falconcam team members Kenn Martinez and Jim Pisello offered their assistance throughout the two hour procedure, and captured pictures as the work progressed. The team ran into a bit of trouble when they found their can of neoprene cement had solidified, but not to worry! They found an able substitute: Mexican Red ladies’ nail polish! The team used it to seal the knots in the heavy nylon thread (otherwise known as mint dental floss!) that secures the transmitter to the harness. The colorful nail polish turned out to be a good match for the harness color too! To keep Quest calm during the procedure, she got to wear a red falconer’s hood, and it worked. She went through the fitting with only a couple of squawks. With the transmitter in place, Quest was returned to the nest box. As you can imagine, Mariah wasn’t too happy that her daughter had been eyas-napped, and she let the transmitter team hear her displeasure with lots of kacking and aggressive fly-bys. As Quest’s feathers continue to grow she’ll preen them around the harness, and it won’t interfere with her flying, hunting or eating. As soon as she starts moving around, we’ll plot her travels on a map so that everyone will be able to follow her as she “peregrinates”, or wanders on her own quest for adventure! We’ve fitted transmitters to several of the Rochester falcons in past years. They always generate a lot of interest, a lot of questions, and some concerns, so I thought I’d take a moment to provide a little more information about them. The modern satellite transmitter for a Peregrine weighs less than 5% of the Peregrine’s total mass. This 22 gram transmitter was fitted to the largest of this year’s females, Quest. We haven’t weighed her, but female eyases at fledging usually weigh somewhere around a kilogram or so. The transmitter and harness are about 2% of her fledging body weight. These birds will shortly be carrying food brought to them by their parents that will weigh hundreds of grams, so the weight of the transmitter is inconsequential to the fledgling’s ability to fly, hunt, or perform any of the normal functions you’d expect from a Peregrine including mating and raising a family. Why fit a transmitter at all? Well, it turns out that even though Peregrines have made a remarkable comeback from the brink of extinction by moving into urban environments, we don’t actually know a lot about the migration patterns of these urban-raised Peregrines. Leg bands can be helpful, but they’re only useful if you can actually get close enough to read them. For a falcon on the wing that’s nearly impossible. During a migration the only way to read a band would be to capture the migrating bird every few days along its route. If you think about what it would take to actually do that in terms of time, people, and other resources, you can see that the odds are pretty small for getting any useful data that way. The great advantage of a transmitter is that we never have to touch, see, or interact with the falcon at all in order to follow its movements. We’ll be able to get updates every few days showing the bird’s actual location, so we can plot its travels over time. This provides the potential to learn more than we ever could about migratory patterns, even from many hundreds of banded birds. Since Mariah has been nesting in Rochester, four of her offspring have worn transmitters. Unfortunately, none survived their first year of life. At first glance, it might seem that the transmitter acted as some kind of hindrance to the birds, but that’s really not the case. Studies of captive birds wearing transmitters have shown no difference in their behavior, flight or hunting capabilities once they have adjusted to the transmitter. In Quest’s case, she’s ahead of the game because she’ll be wearing it beginning with her first flight. The simple fact, as we have pointed out many times here at Imprints, is that the first year of life is hard for Peregrines, and many just don’t survive. In this year’s group, it is likely that three or more will not survive their first year. Of Mariah’s 38 fledglings from 1998 to 2007, we know the whereabouts of only 5. We know of the deaths of 7. So taken together, we know the status of less than 1/3 of her fledged offspring. It is likely that many more failed to survive than the seven we know of. So 4 out of 43 eyases have had transmitters. That’s fewer than 10% of Mariah’s offspring. Since the first year survival rate is something less than 50%, it is not surprising that all of the falcons fitted with transmitters have died. The two whose circumstances we know about– Hafoc and Skye– both had causes of death that had nothing to do with their transmitters. Hafoc was hit by a car, and Skye was the victim of a predator. 2001’s Mary Ann got a transmitter after she was rescued from the street and spent several weeks recovering. Her transmitter stopped working near Braddock Bay during the fall of that year. Given the time and her position, it is likely that she too fell victim to a predator, most likely a Great Horned Owl, many of which are found in the woodlands around the bay. 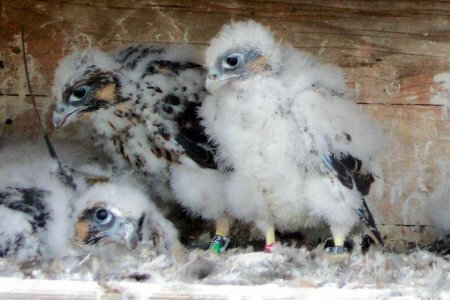 Finally, I’d like to repeat that the first priority of the New York State Department of Environmental Conservation, Genesee Valley Audubon Society, and the Rochester Falconcam, is the safety and well-being of Mariah, Kaver and all their offspring. We have invested much of our lives, time and effort to maximize the chances for their prosperity. We won’t do anything to jeopardize these marvelous creatures or their success. This entry was posted on Thursday, June 5th, 2008 at 11:42 PM	and is filed under Journal. You can follow any responses to this entry through the RSS 2.0 feed. Both comments and pings are currently closed. Yea – it’ll be fun to follow Quest’s travels !! Thrilled to see we’ll be able to follow Quest’s travels. Just curious….why do the first 2 images refer to “Grace” when viewing Properties?? Who pays for these things, I remember one year at school we raised money. Wonderful explanations of all the events of the day !! @Donna Lurker- That’s my bad! I labeled the pictures quickly this evening and I’m afraid I had Grace from last year on my mind instead of this year’s Quest! @Angela- We’ve received a grant from the DEC to pay for monitoring the transmitter this year! At what point in their development will the eyases be able to self-feed? When will the parents be able to leave a carcass in the nest and let the eyases dissect it on their own? What were the ages of Hafoc and Skye at time of death? 22 grams is approximately .776 of 1 oz. By perhaps a drawing, can you show the full length and bulk of the transmitter in relation to a fully grown peregraine and its position and fit to the body? Thank you for all the information that you provide. @George- The eyases are already beginning to feed themselves. Although Mariah and Kaver often still feed the young, they have begun leaving food in the nest box for the young to eat on their own. @ENB- Hafoc lived for a little more than nine months. Skye survived only four. I’m not much of an illustrator, but you can see some pictures of transmitters at the Canadian Peregrine Foundation’s Project Track’em and on the Migration Research Foundation’s Rochester page. Here’s another picture of Hafoc from Rochester Falconcam team member Jim Pisello. The pictures– particularly those of Hafoc– show the transmitter on a fledged bird, rather than an adult. Fledged birds are as big as they’re ever going to get so you should be able to get a pretty good idea of the size. The statistics at first read are surprising, unfortunately we can’t control nature so it really isn’t as big a surprise as originally thought. (sad but true) I hope Quest makes it to adulthood. It will be fun and interesting to keep up with her travels. Thank you again for the update! It’s greatly appreciated! Quest will continue to grow and I suppose the harness will expand? Between you and me I hope the darn thing falls off. Thank you for the information. As a novice observer it’s hard not to be concerned about the transmitter. (especially knowing the past survival rate which I understand had nothing to do w/ the transmitter). Hope Quest has a long and healthy life . It will be interesting to track her travels. What an education I’m getting! 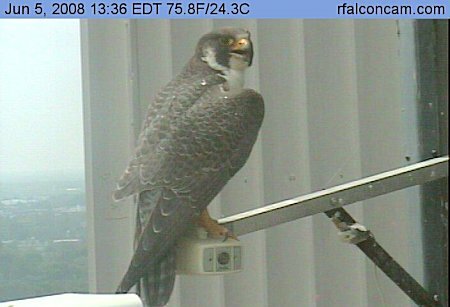 Perhaps we should put monitors on humans to track all of the work that ISN’T getting done b/c we’re watching falcons! Again, thank you for your response and all the info provided. @goptl- The harness has been fitted with growth in mind. It has a limited life of a few years (by design). 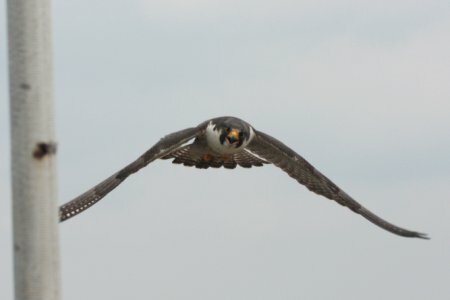 Interestingly, one of the CPF’s tracking project falcons, Nate, became something of a worldwide superstar, successfully breeding for several years while wearing a harness and transmitter. Well, that’s better. I hope Quest can make it two years. Come to think of it I wish all of them could make it at least two years. This is the 3rd year of watching from ND. My wife and I really like this and darn it, a person does become attached to these darn birds. Thanks to all that make this site possible. Jess – Thank you so much for the informative explanation and all of your dedicated work. It’s quite an eye-opener to know just how rough nature can be on the rate of survival. I really appreciated the status report on some of the others, and I really enjoy being able to see this annual event, even though remotely, at such a close and constant range. Thanks again. Jess, is there any way you can put the band colors and names up on the website under the pictures from the camera’s like you did last year? It is so much easier to see it right in front of you while watching them. Thank you so much for all the info, you do a great job. THANK YOU, THAT WAS A GREAT INFORMATIVE ARTICLE. I WASN’T AWARE OF ALL OF THE FACTS, AND SPOKE OUT OF IGNORANCE ABOUT IT, AND MY DISLIKE. NOW THAT I UNDERSTAND, IT IS GREAT THAT YOU CAN DO THIS. I ONLY HOPE ALL OF THIS YEARS CHICKS WILL FARE WELL, AND OF COURSE MARIAH ANS KAVIER. ALL OF YOU INVOLVED HAVE DONE A GREAT JOB AND I THANK YOU. A further question on the use of transmitters, is there any science to indicate that peregrines or birds in general, have unique radar or sensing ability that allow them to navigate and to avoid danger, and that the transmitters may interfere with such abilities? I was showing a new child in the classroom my “friends” and telling him about them, and I saw that and was a little freaked out. Glad to know what it is. Couldn’t really check at that point, we were just looking at pics, then we had to go do something else. She was in a good position for us to get a good look at it. Thanks for all the info. Thanks for the explanation and all the other info. There’s no doubt in my mind that the team is acting with total commitment to the best interests of Quest and all the peregrines. I’d like to chime in with Debbie on her request for a quick post with band colors and names. Makes it easy for us “lurkers” to quickly ID who we’re seeing. One more request, if possible….I’d LOVE to see the Main Camera pulled back a bit so we could see the entire nest box and perch. The eyases are getting so big now and it would be great to be able to get the best view possible. You & the rest of the team are doing an outstanding job here. My husband and I send our sincere gratitude & appreciation. My first year of watching and love it! What are the areas featured in the backgrounds of the views? I see a baseball field in one. Keep up the great pictures and news. I know death is a morbid subject, but as I was reading your article, I was just wondering….. Under “HISTORY”, then “Family Tree”, when you update this area with the 2008 (5) offspring, is it possible to add a code for ‘deceased’ by the appropriate falcon if that information is known? This might also be a nice place to have band information (like shakymon’s bandtable) on each of the offspring so it is available in one particular place. Also, you listed Hafoc, Skye and Mary Ann as deceased, what were the names of the other 4 and how did you discover they had died? Thx! Thanks for the update! I never knew how many die in just their first year. OH and Jess thanks for answering my question! Am I seeing things? Looked like I saw blood on the front of one of the birds. I coulded find out which one it was. This was a fw days ago. Anyone else see this, hope it was just the lighting…. Caye-I’m sure it’s Quest’s bright pink transmitter harness-it’s sort of “H” shaped-it does look red in some light. 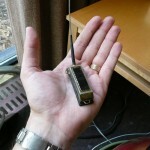 Is it possible to find out the radio frequency that Quest’s transmitter operates on? As an amateur radio operator I’m interested in seeing if I can receive her signal. I STILL WISH THERE WAS A SMALLER TRANSMITTER YOU COULD PUT ON QUEST..LIKE ON HER LEG LIKE THE OTHER BAND. SEEMS LIKE IT WOULD GET IN THE WAY. I KNOW YOU ALL KNOW WHAT YOU ARE DOING, BUT WITH MODERN TECHNOLOGY, YOU WOULD THINK THERE WOULD BE A SMALLER AND BETTER WAY TO DO IT. COULD YOU TELL ME, DON’T THEY NEED WATER AT TIMES? Anyone else? just a temporary fluke? ENB It did the same for me I was wondering too. Guess im not the only one with problems. Every year I watch and read all that is going on with our Falcons. As always everyone involved does such a great job. A lot of Love is out with all . Thanks so much for being the people that you all are. Personally I would love to attach a transmitter to the researchers that insist on attaching them to animals…. It still looks like there are only 4 in the box this morning. Did one jump out? What happened, curious minds would like to know. No worries Mark and Lucy. All five are still in the nest box. They were just fed around 7:48 a.m. and it’s now 8:30 a.m. (EST). They’re very good at hiding, especially when it’s this hot and they go flat like pancakes. – Carol P.
I am so affraid that this may hinder her in some way. SO SAD….. Yes, I am also wondering if they are still all in the box. Mariah has been there alot an squawking like she is mad about something. For the life of me, I cannot see 5. It is currently 11:24 am EST. I’m with you Corinne – I only see 4 and Mariah is still in the box at 11:47…? Sharon thanks for the infor about the bands, but I was hoping for them to be posted under the pictures instead of looking else where while looking at these beautiful creatures. I am the band colors and names written done until I can remember which one is which, but last year was much easier to just see it right in front of me on the computer screen. Great job you are all doing. Thanks Jess that is perfect. @12:16 clearly see 5 plus Mariah. For all those worried about disappearing eyases…they are all still there, they just blend in very well with the wood of the box now that their feathers are coming in, particularly when the box is in shadow. You don’t realize how well their camouflage works until this stage of development. But even if one had fallen out of the box there’s nothing to worry about…it would be fed by M&K down on the walkway until it was joined by it’s siblings. Be very thankful to watch these 5 eyasses growing like weeds !! All three of them on the WAMU building here in Seattle died at two weeks of age. They were able to retrieve at least one for examination. They said they had not seen this type of mortality on the ledge or in the area. Happily, there are other eyasses successfully growing and banded in Seattle. Jess – I really appreciate all your explanations and information. Thank you !! It’s extremely hot here in Rochester, NY today. Mariah is using herself to shade the 5 eyases in the nest box. I was out at noon today and saw both Mariah and Kaver. All is well. No eyases in the playpen (the walkway just below the nest box). Their mouths are open because they are warm. How do they get water? Is it soley from the food? Excellent information Jess. It will be great to monitor Quest’s travels. Thanks, for all that you and everyone else does for this site and the falcons. By the way will you be looking for fledge watching volunteers this year? JESS..IT APPEARS THAT DIAMANTE HAS A FILM COVERING HIS LEFT EYE..HAVE YOU SEEN IT?